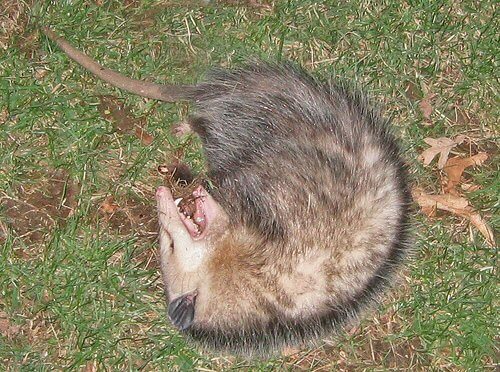 I always remember that whenever my sister and I were pretending to be asleep (like if we didn't want to get up and do chores on a Saturday AM) that my parents called it "playing possum." However, last night around midnight, I got to see it for real. John woke me up to look in the backyard and sure enough there was a HUGE possum with tongue lolling out looking for all the world that it was dead. Our guess is that we let the dogs out while he was there and he just rolled over to be sniffed at a bit. John touched it with his toe and it flinched--which gave away the game. It layed that way for a very long time (we watched through the window until I was too sleepy to stay). This morning, it was gone. Escaping safely under the fence. In case you are wondering what it looked like, it is pretty much like this photo from http://www.bbwildliferemoval.com/images/opossum2.jpg Though my guess is the one we saw was about twice that size. Ashley, that is hysterical. Ours looked much bigger. Maybe pregnant?